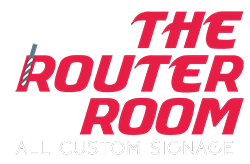 Whether your need is for a single display with complex design; a large interior, custom ADA project; or a corporate logo on a high-rise building, The Router Room can manage your projects of any size. It okay! You can expect this everytime you work with The Router Room. If you did not find exactly what you’re looking for in our products section, just give us a call.